You can post a video or a text entry. If you do a video, you need to upload to one of your platforms and provide a link to the video on your entry. You don’t upload your video to the HeroX platform itself. HeroX affirms it works on mobile, but if you are having issues you may want to try another browser? Hopefully that fixes it. If you have issues, feel free to notify us so we can continue reporting. Because of the issues reported, we’ve extended the entry period to January 15th, and reduced the voting period from January 16 to January 31st. We have great news as well – the Global Mental Health Movement has agreed to let us showcase the winner during the meeting, where leaders in mental health around the world are going to hear your message! So exciting!! Thanks so much, and can’t wait to see and share your entry! Ps. Don’t’ know what we are even talking about? 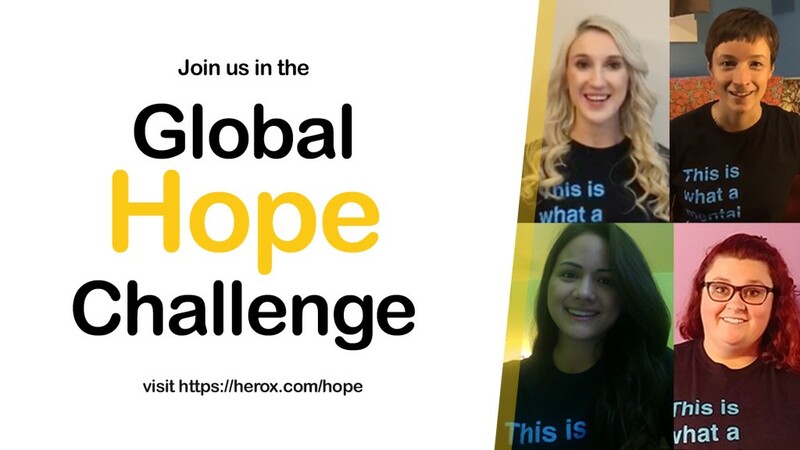 Check out the press release on the Global Hope Challenge to learn more.